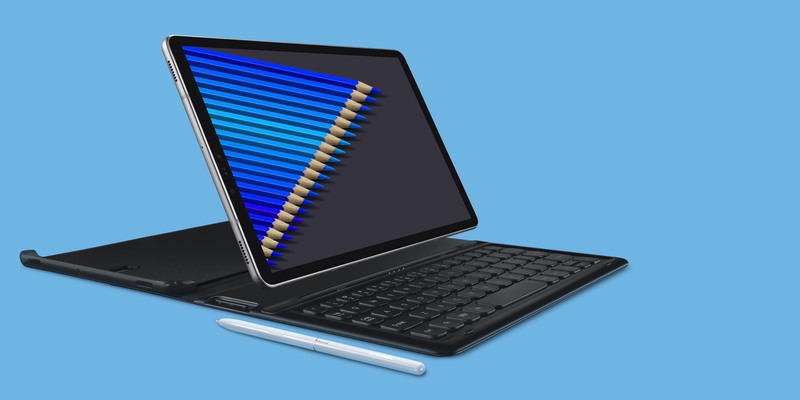 Samsung has finally revealed the Galaxy Tab S4. 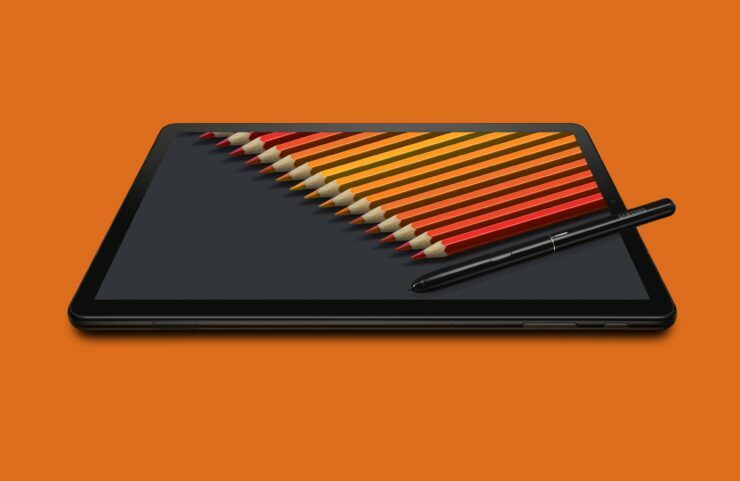 Just like its predecessor, the Galaxy Tab S4 is a 2-in-1 productivity-oriented slate that comes with the S Pen. 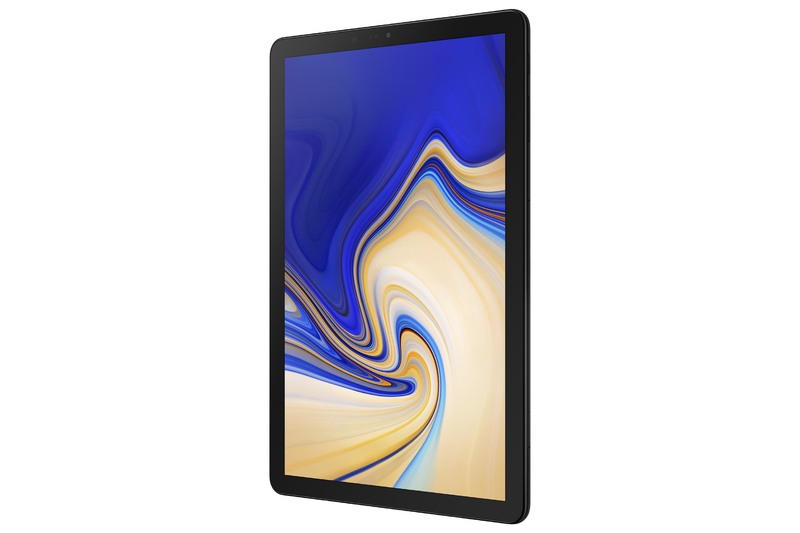 The Galaxy Tab S4 features thinner bezels than its predecessor, a Super AMOLED display, and an impressive aluminium build. President and CEO of Samsung Electronics’s smartphone division, DJ Koh said that the tablet offers increased mobility and improved performance and is the first Samsung tablet to feature DeX support which will provide a desktop-like experience by transforming the user interface. The DeX will also enable users to use the tablet as an external monitor. 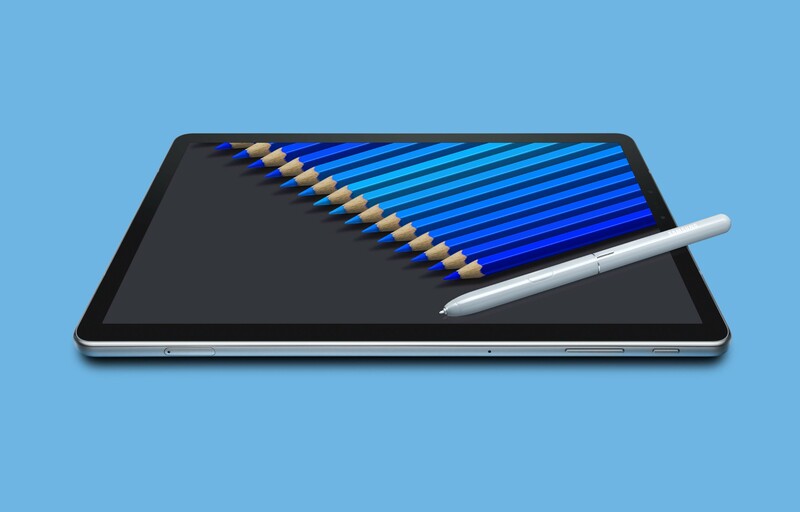 The S Pen will ship with the latest model and it will help you take notes on the go using the Screen Off Memo feature, navigate the UI, and organize notes using Samsung Notes. The display has an aspect ratio of 16:10 and a resolution of 2,560 x 1,600, resulting in clearer image and video quality. Additionally, the slate has four speakers that come with Dolby Atmos support and are tuned by AKG. The Galaxy Tab S4 runs Android 8.1 Oreo with the latest version of the Samsung Experience. It is powered by the Snapdragon 835 and supplemented by 4GB of RAM. It comes within two storage configurations: a 64GB or a 256GB one. The internal memory is expandable up to 400GB using the microSD card slot and keeping the tablet running is a large 7,300mAh battery. The Galaxy Tab S4 also ships with new features such as Samsung Flow and SmartThings app that will make it easier to manage your connected devices. 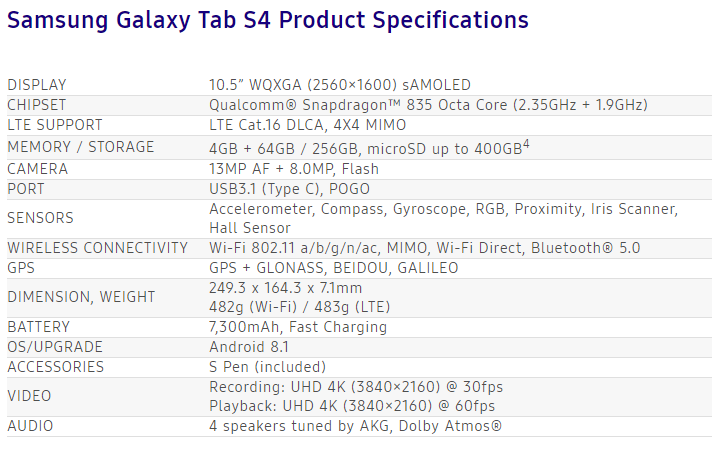 The Korean giant has also unveiled the Galaxy Tab A4 10.5, which was revealed alongside the Galaxy Tab S4. It features new family-oriented entertainment features which make it a great portable, entertaining device. It also has connectivity features such as SmartThings that makes it easier to manage smart home devices. The tablet has a 1,920 x 1,200 LCD display and is powered by the Snapdragon 450, accompanied by 3GB of RAM, along with 32GB of onboard memory which is expandable via the microSD card. The tablet has a 7,300mAh battery and runs the latest version of the Samsung Experience based on Android 8.1 Oreo.